Hanoi (VNA) – Hosts Malaysia overtook Indonesia to lead the medal table at the 29th Southeast Asian Games (SEA Games 29) with three gold, two silver and one bronze medals on August 17. Indonesia is second with two gold and one bronze medals, followed by Myanmar with two gold medals. Singapore collected one gold, two silver and two bronze medals, taking fourth place in the medal tally. Thailand climbed one spot to fifth in the tally with one gold and one silver. Meanwhile, Vietnam added another silver to its medal collection, jumping to the sixth place. Despite grabbing two more bronze medals on the second day, the Philippines dropped to seventh place, followed by Laos with one silver and one bronze. Cambodia and Brunei each pocketed two bronzes, ranking ninth and tenth on the tally. Timor Lester has not won any medals and remains rooted to the bottom of the table. 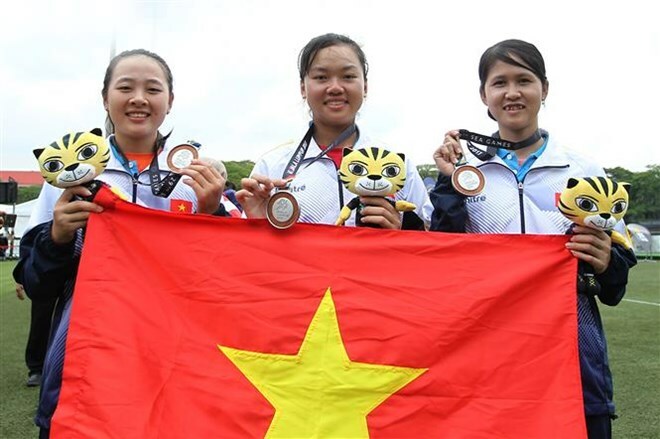 Vietnam’s second silver was secured by the female archery team including Chau Kieu Oanh, Le Ngoc Huyen and Nguyen Thi Nhat Le after losing to Malaysian athletes in the women’s team compound final.